National Street Rod Association (UK) | Keeping you safe on the roads & at events! Keeping you safe on the roads & at events! 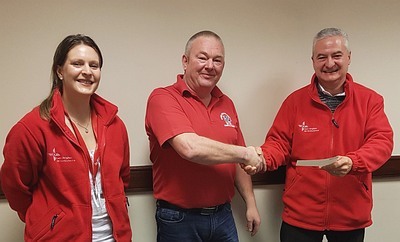 On Sunday 21 January, the NSRA presented a cheque for £1,000 to Andy Lewis and Kay Cousins of the East Anglian Air Ambulance. The East Anglian Air Ambulance is a charity that is close to our hearts. We are proud to be supporting the lifesaving work that they do to help keep us safe on the roads and at events. This money, raised in 2017, by charity auctions at the Hot Rod Supernationals, in collection buckets at NSRA events as well as a donation from the NSRA, will go towards keeping the Air Ambulances flying and the Rapid Response Vehicles mobile. Since their launch in 2000, the East Anglian Air Ambulance have attended over 21,000 lifesaving missions, touching the lives of many thousands of people. Last year, they averaged more than 200 missions per month. The crew comprises specialist pre-hospital doctors and critical-care paramedics, operating out of two high-tech helicopters from 07:00 until 19:00 from the Norwich base and from 07:00 until 01:30 from the Cambridge base, 365 days a year! Operating in Bedfordshire, Cambridgeshire, Norfolk and Suffolk, EAAA are able to provide emergency medical services to a vast area. When necessary patients are flown to the most appropriate hospital for their needs. To keep this vital service going, they need to raise £12million a year to deliver and develop their lifesaving service; as a charity, they rely entirely on the generosity of supporters to keep flying. We look forward to continuing our support of the East Anglia Air Ambulance this year and welcoming their representatives to our events. If you see an EAAA representative at an NSRA Hot Rod show this year, take a few moments to find out more about the work they do.